For more than 125 years, the Carhartt brand name has been synonymous with durability, performance and style. The familiar “Carhartt Brown” and iconic square logo patch communicate the Carhartt brand message more than any other imagery. 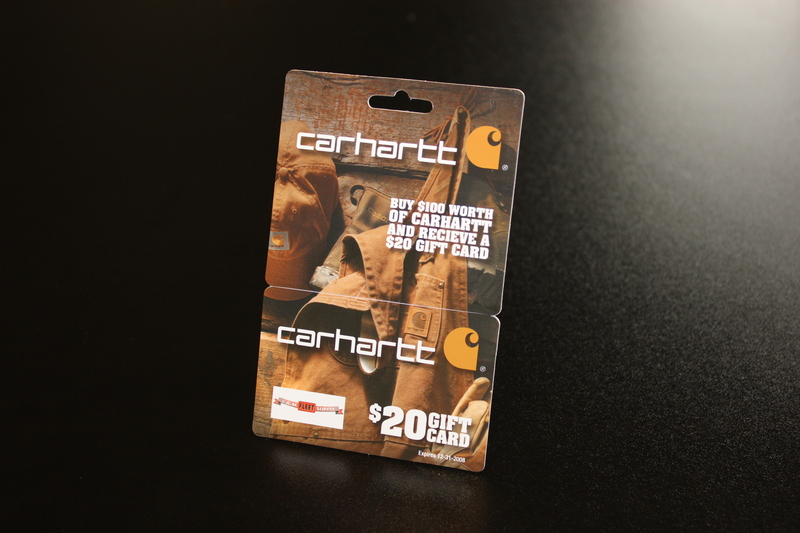 That’s why Carhartt choose large-format hanging gift cards that let their clothes do the talking. The additional real estate offered by hanging gift cards provides companies with an opportunity to go big with product images and backgrounds that stand out at the point of sale, providing an upsell opportunity. The extra surface area can also be used to highlight promotions and new products or services. Hanging gift cards deliver versatility when it comes to display options. One of the most attractive display options is on merchandise walls or floor fixtures that utilize slat-wall surfaces, making it possible to hang gift cards from rods adjacent to merchandise in multiple locations throughout the store, increasing customer impressions. Hanging gift cards can also be displayed at the point of sale using a countertop hanging display or even a traditional pocket display. When choosing gift cards as gifts, it’s all about the perception of value. While everyone has a different perception of value, it’s usually linked to one or more factors, including dollar amount, merchant, and packaging. As the saying goes, there’s no accounting for taste. People like the merchants they like, and the value perception of a dollar amount is closely linked to the price of the merchant’s products. However, when it comes to value perception through packaging, the merchant has influence. Choosing a hanging gift card is one way to influence the purchasing decision. Due to their size, hanging gift cards not only look more substantial to gift recipients (especially when wrapped), but also to buyers, who want to make a strong gift-giving impression. By combining iconic brand imagery on a large format gift card, Carhartt has found a winning combination to increase company revenue and make their own substantial impression in the marketplace.